The media calls them armed thugs and US Senator Marco Rubio wants them put on the terrorist list, but who are Venezuela's colectivos (collectives)? Green Left Weekly's Federico Fuentes met with some of them to find out. Cucaracho — 'that's what they call me' — is a member of the Alexis Vive colectivo, which is active in this historically militant neighbourhood strategically located close to the presidential palace. Demonised by the international media and targeted by the opposition, the colectivos have become a symbol of scorn for President Nicolas Maduro's opponents. They are regularly portrayed in the media as armed gangs and the last bastion of support for Maduro's government. But the reality of the colectivos — like almost everything in Venezuela — is vastly different. Almost all of them are community organisations that have flourished under Venezuela's Bolivarian Revolution. Profits from all of the commune's enterprises are deposited in the communal bank and redistributed to projects decided upon by the community. 'The idea of the commune is to disperse power', explains Cucaracho, 'so that the people are the ones who make the decisions. 'Our role is to train cadre and teach people about the strategic vision of the commune. 'The opposition are the violent ones,' one of them said. 'They loot shops, set houses on fire. So what happens? We, the motorizados, come out and then they run away, they don't come back. Junior is a member of the Bolivar and Zamora Revolutionary Current (CRBZ), another group denounced in the media as a colectivo, but which has its origins in a group of campaigners for peasant rights formed in the '90s. 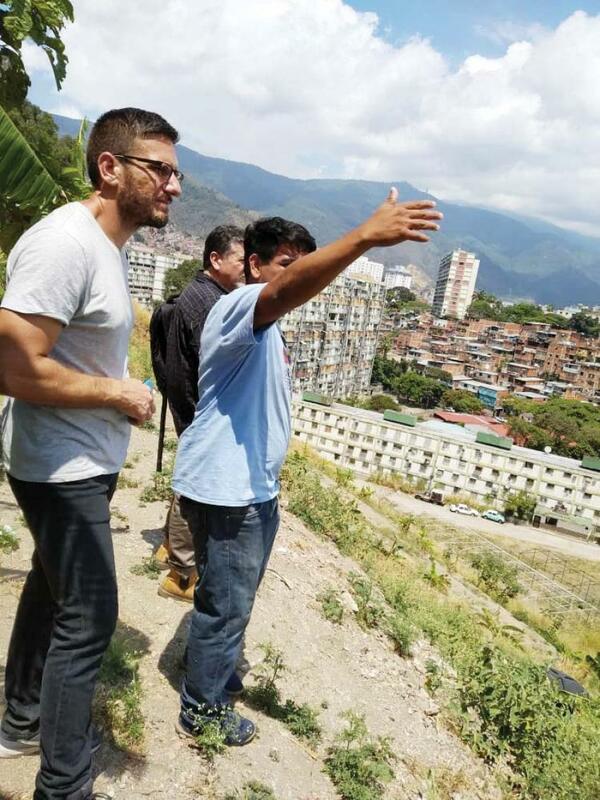 He was among those present on the Venezuela-Colombia border on February 23, when the United States sought to violate Venezuelan sovereignty under the pretext of bringing in 'humanitarian aid'. The build-up to the events on February 23 meant that the possibility of violence was ever present. Not knowing what to expect, Junior explained that they 'psychologically prepared for the worst, for anything that might come. 'You couldn't go there thinking about your family, your children. So you had to go there thinking about your contribution to the revolution, to defending your country, the fact that you are going there to fight for your mum's future, your dad's future, the future of my children and the children of my children. In the end, the opposition's mission failed. Even the media's lie that the Venezuelan armed forces had burnt trucks carrying humanitarian aid was revealed to be false when videos emerged showing opposition protesters had cause the fire. 'On February 23, there were some small protests on this side of the border in disputed areas, areas where you have Colombian paramilitaries who are struggling to gain control of the area because it's a strategic region for them. 'The media generally does not portray the reality of events. The reality is that the violence overwhelmingly comes from the opposition', Junior said. 'The opposition always tries to provoke violence because they know the media will simply say the government is responsible, that the government represses the people, and use this as an excuse for intervention. 'The media always take the side of the opposition; they don't tell the truth. Rafael Ramos, a postgraduate student at the Institute for High Studies in Diplomacy Pedro Gual explained that the media's portrayal of the colectivos has a clear intention. 'This editorial line is pushed to make international public opinion believe that Chavismo has lost all its support. 'They are introducing the idea that Venezuela is supposedly a dictatorship, with no freedom of speech, and that Chavismo is just limited to a few remaining supporters who potentially have to be exterminated. 'Because they're just a few people, then violence against Chavistas, the colectivos, is justified. The media dehumanises them, portrays them as non-human, so in the end it doesn't matter if they treat them like animals or kill them. 'We are human beings, like everyone else' said Robert Longa, whose voice I had heard through Cucaracho's walkie talkie. 'We live in the community, participate in the commune, attend assemblies, study and look for ways to produce food to deal with the crisis. 'But we are conscious that we are in a war. 'They attack the colectivos because we are willing to defend our model. The colectivos are organised with the aim of deepening the Bolivarian Revolution through popular organisation and the creation of the communal state. 'There are people that claim to be Chavista but that are killing Chavismo. There are people who have infiltrated state institutions and who work against us. 'The people want the revolution to be deepened. They want the bureaucrats kicked out once and for all; for the land to be given to the peasants and the factories to be taken over by the workers. 'We want a radicalisation of the revolution. We want all power to the people: that is what we seek. The views expressed in this article are the author's own and do not necessarily reflect those of the Venezuelanalysis editorial staff.